Our favorite music should really be able to come along wherever we go, and why on Water should bathroom make an exception? 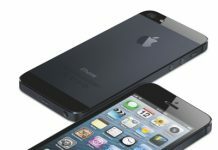 It’s high time our MP3 players, iPods and iPhones should take to water like ducks. And here’s what seems to be the answer to the prayer (or to the player?) 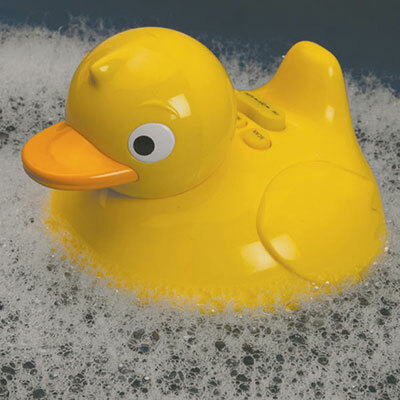 – the iDuck Wireless Speaker, our childhood friend who has returned with that additional bit of bathroom comfort. So, while we are waiting for the time when we will be born with an iPhone installed inside us, better let it stay as far from the bath as it is possible and let that duck with a wonderful voice join us in the tub as a perfect waterproof minstrel. There is an egg-shaped transmitter that you have to attach with a 3.5mm connector to your MP3 player or iPod before you take the plunge. Then you can go for a good wet scrub accompanied by the musical duck and enjoy having your favorite vocalist or band getting you in the mood for the rest of the day. 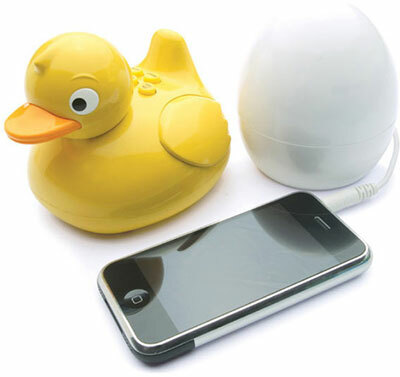 The iDuck Wireless Speaker carries the price tag of around $40 (£25) and requires four AAA batteries with three batteries more for the egg transmitter. After that the only danger from water will be that you may want to spend more time in the bathroom! Source of the image: Geekalerts.